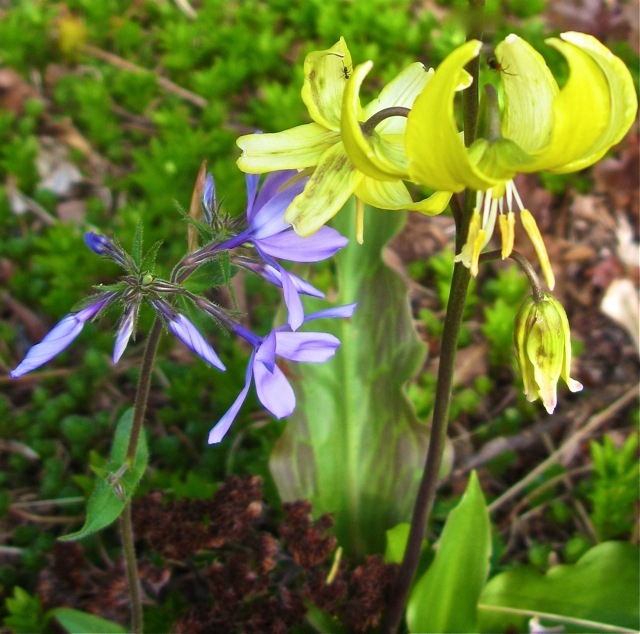 Fawn lily, Trout lily, Dog-tooth Violet: Beautiful, evocative and curious, the common names for the various North American Erythronium species are as delightful as the lovely woodland flower itself. In Northeastern forests, yellow trout lilies are a common, early-spring, ephemeral wildflower. As a child, I collected these tiny, golden beauties in the forest behind my home, and presented them in little bouquets to my mother. When I was a little girl, the mottled green foliage of the trout lily made me think of a frog. Soon I confused the name, and called them ‘toad lilies’ for years – even now I catch myself making the mistake. 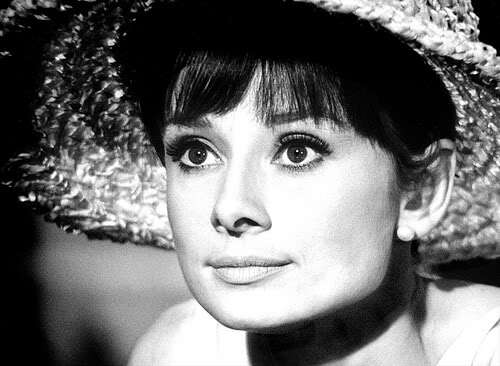 The flowers themselves remind me of little yellow hats, especially when I catch them bobbing up and down in the morning breeze; fancy and feminine, like bonnet Audrey Hepburn might have worn. 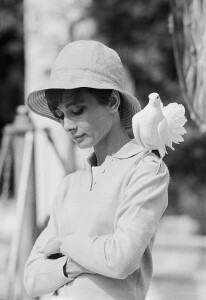 Audrey Hepburn films are some of my favorites, (Photo Still: Paris When it Sizzles, 1963, © Bob Willoughby). She is definitely a Fawn Lily to me. What do you think? 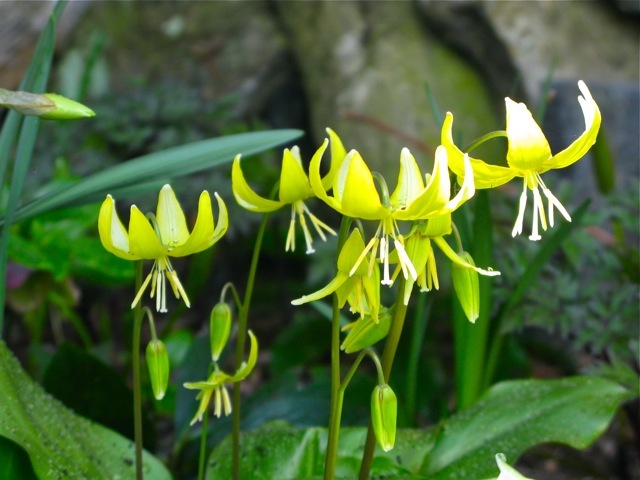 § 4 Responses to Trout Lily, Fawn Lily, or Dog-tooth Violet: No Matter What You Call This Woodland Beauty, Erythronium is a Springtime Delight…"
Please share if warranted. Thanks for your blog and being on FB. Thanks Nancy, these are excellent resources. 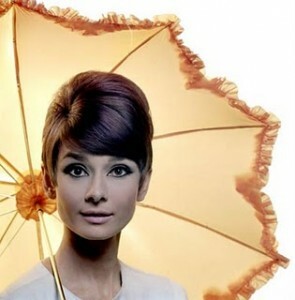 I’m not sure if I posted that in my blogroll or not… my right bar needs some weeding! You have reminded me to get on that, and also to list this in the notes for my upcoming seminar. Thanks for this post, Michaela. I have seen these beauties while hiking and wanted to know about them. I saw several red trillium in bloom while hiking Temple Mountain last Friday. What a treat! 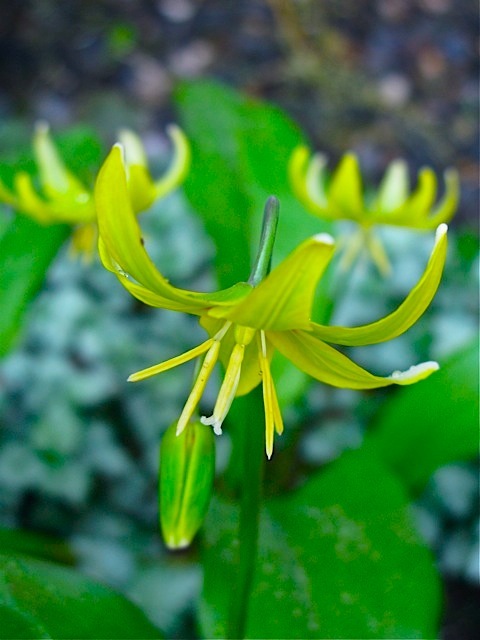 You are currently reading Trout Lily, Fawn Lily, or Dog-tooth Violet: No Matter What You Call This Woodland Beauty, Erythronium is a Springtime Delight… at The Gardener's Eden.